after my ankle surgery. This is a knee caddy. "Crystal, come with me to my room so we can play!! ", Rayna exclaimed cheerfully on Christmas day. 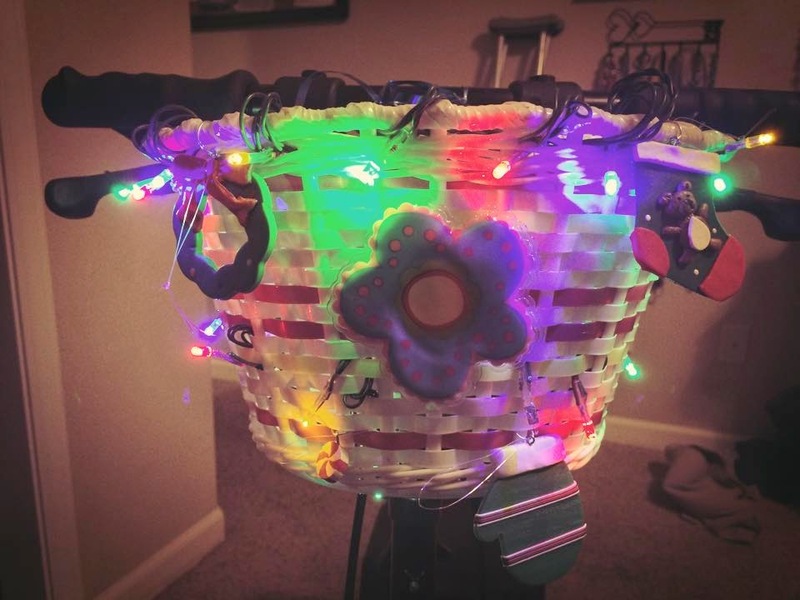 Gliding down the hallways of her house on my fancy, better-than-crutches, knee caddy with my blue cast resting upon the leather seat, I followed my excited 4-year-old little cousin who was ready to play with her newly opened Christmas toys. Once arriving to her princess/Mickey Mouse themed room she instantly sat on the floor and started to play with her new Lincoln Logs. I stood there casually, on my one good leg watching her, as I talked with another family member in the room. And then I ate it. Before I realized what was happening, my still-bent right knee with my casted leg abruptly hit the (thankfully) carpeted ground. Confused as to how I could fall while standing perfectly still (I mean, I know I'm accident prone...but even that was a weird one for me! 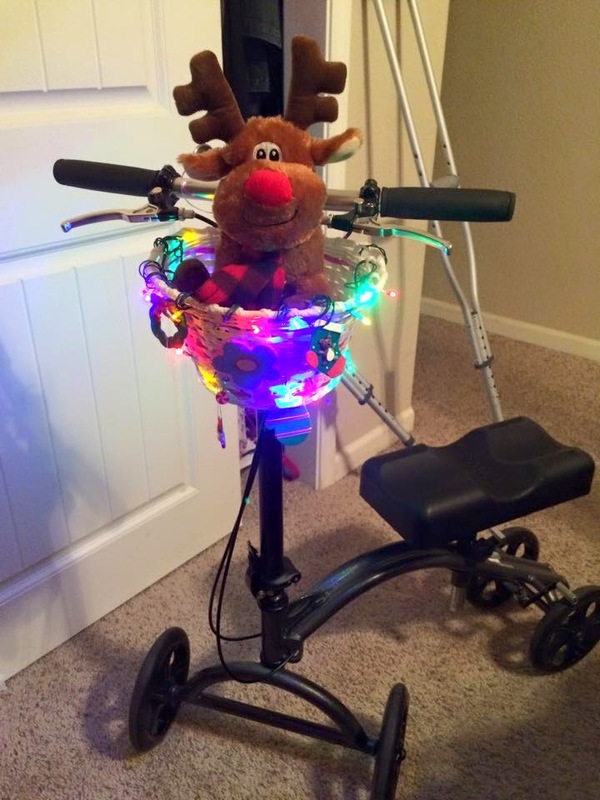 ), I looked at my knee caddy and instantly knew there was no way I'd be getting back on it. There was no way, as the seat was tilted and broken off the base of the scooter. For the rest of Christmas day, I went back and forth from the living room to Rayna's room by the use of my crutches...All while Rayna continuously asked me throughout our time together, "Crystal, why do you have so many owies?" Replying to my grandmother's text, I asked her what inspired the moment of the video. She told me, "I think it's 'who' and not what. Maybe you??" It was a humorous video to watch, and I had a good laugh...but it was also a good reminder of how observant children are and that they are constantly trying to imitate the actions of those that they look up to. Rayna is in a BIG Crystal phase right now. She's always asking when she can see me again and telling all her friends that she loves family dinners because, "I get to see Crystal!" During Christmas dinner she even made a lengthy toast filled with her thankful heart, ending it with, "...I'm just so thankful for this great big universe, but most of all I am thankful forrrrrr CRRRYYYSSTAAALLLL!!" 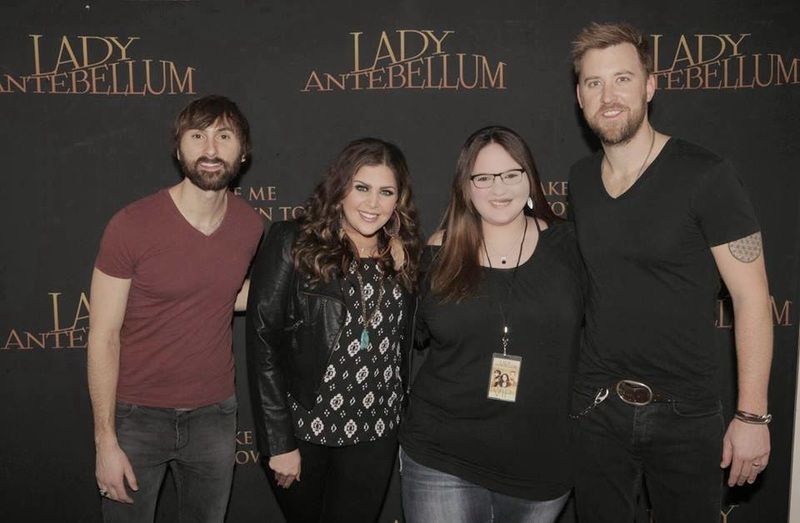 A few weeks ago my my mother and I went to see Rayna and her parents - Krispy Kreme donuts in hand. (Which are a valuable delicacy for my city since we don't have a Kripsy Kreme locally.) Ignoring the donuts, Rayna pulled me towards her parents bed and had me read her one of her favorite books. At some point I told her, "Hey - there are donuts in the living room...Do you want a donut? I love donuts. They are one of my favorite treats." As we sat to eat our donuts, once back in the living room, Rayna exclaimed, "I just LOVE donuts!" Her mom, my aunt Felicia, looked at me and said, "Um...What? No she doesn't. She doesn't like donuts - she never has. I think your little cousin is trying to impress you." I think it's safe to say that she's currently my biggest fan. Or, at least, one of them. And she's watching me. She's eagerly and dilligently listening to my words and to the things I say. She's trying to figure out how to be like me, trying to impress me when she copies my actions and says the things that I say - even when she doesn't like donuts. As a new year begins I know that many people are reflecting from their year in 2014. They are setting their New Year's Resolutions. People are striving to find new ways to live a better life in the coming days - and that's great! As we get ready for our new year by reflecting how we spent the last 12 months and as we plan how to spend the next year, let's not forget the influence we have on others. maybe you have a 12-year-old nephew, an 18-year-old granddaughter, little sister/brother, or you hold a leadership position in a church or school. In the middle of our reflection and attempts to have a better new year let's ask ourselves, "Am I living the kind of life I want my ______ (cousin, child, sibling...insert name here.) to imitate?? Am I choosing actions that I want them to choose? Am I living a life I want them to live? "...Because their little eyes are watching, their ears are listening, their minds are memorizing, and their actions are copying. They're ready to tell you that they love donuts, even when they never have...just to impress you. The children in your life, whether they be your own or not, are looking up to you for guidance. Even if you don't think you are - you are a role model. You are someone else's inspiration. You represent what someone wants to become. 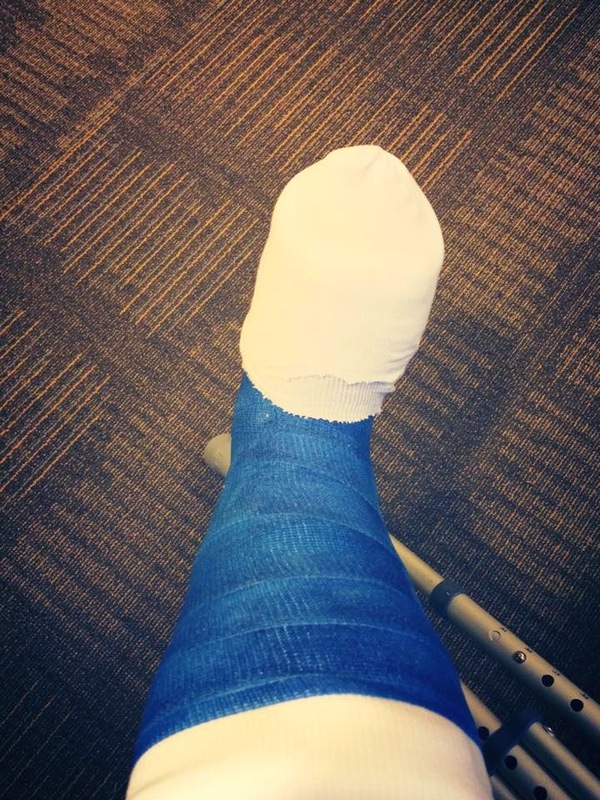 Earlier in the year I posted a blog entry, Ankle Surgery...Fun? ?, which was filled with pictures of my beautifully decorated post-surgery casts. I figure that it is always important to create some fun in not-so-fun situations, right?? 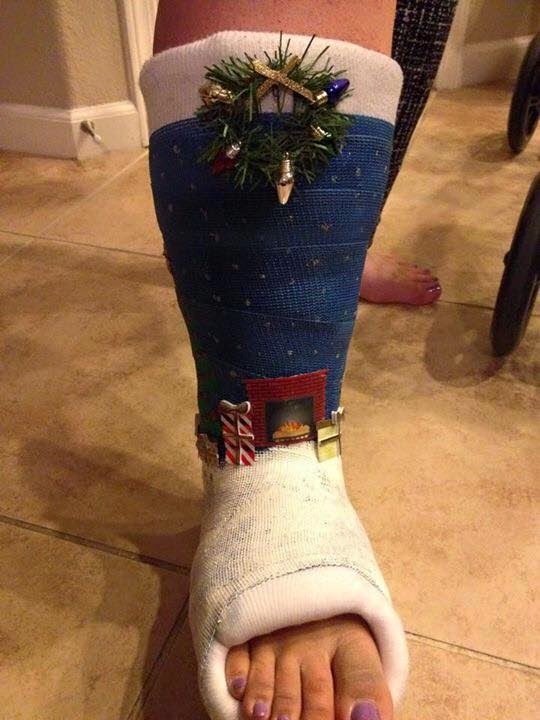 Well, in November I re-hurt my ankle and am in a cast once again. Lame, I know. 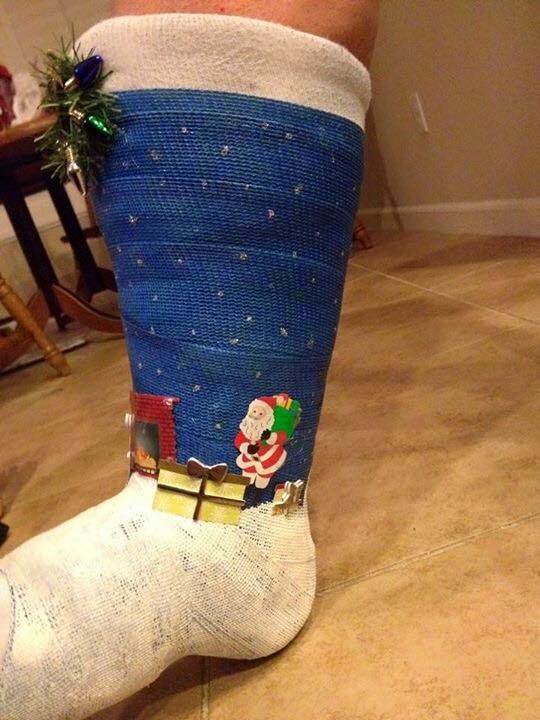 In my family, however, a cast is now just another form of an empty canvas! 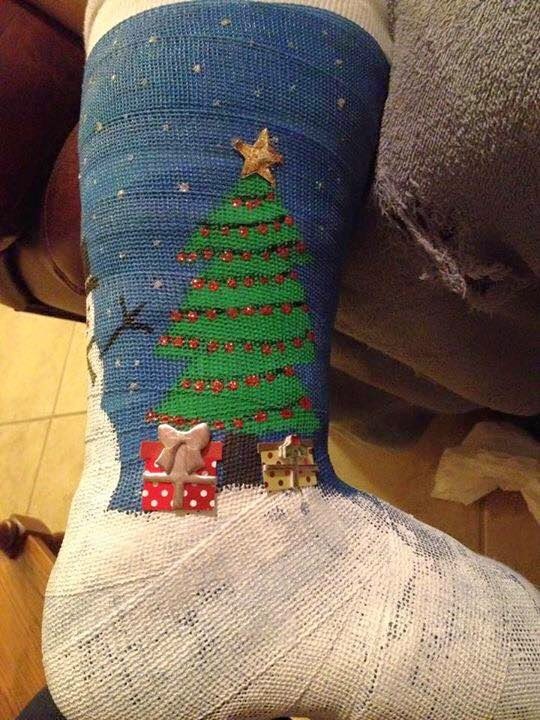 And with it being the Christmas season, my sister (Amanda Howard) had fun decorating another cast! Just like with my last casts, I let my 4-year-old cousin pick the color. This year Rayna picked the color blue! sleeping. Haha.) 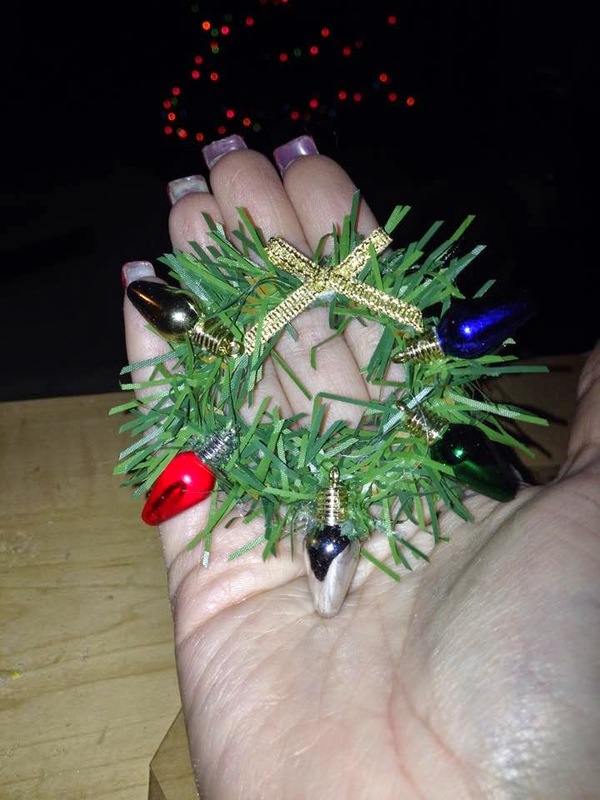 and she made a wreath! How cute is this? I should have planned my pedicure accordingly. ...And the painting and decorating began! 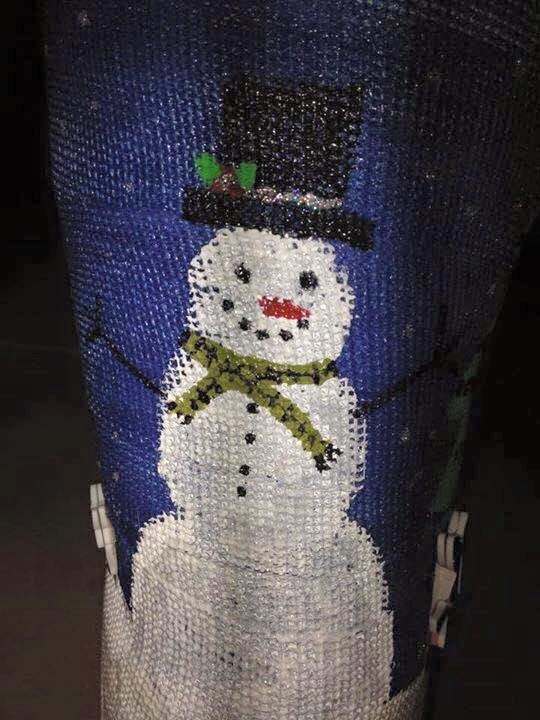 The snowman is on the back of my cast. ...Do you want to paint a snowman???? It wouldn't be a Christmas cast without the tree! I think it's safe to say that my mother, sister, and I make a great, festive team! It's time for another year to come to an end. As I sit back and reflect on the many memories and moments I was able to experience throughout 2014, I realize what a crazy and adventourous ride it has been. Spent half the year on crutches. Finally expressed my interest in becoming a speaker and started a new career - which was a buried 7-year-old dream. Was accepted to attend the University for the Deaf and hard of hearing (Gallaudet) for summer classes. Received a college scholarship for my academic achievements. Took a writing class on how to write memoirs. Started going to coffee shops just to read and write. Moved up in my job from being a noon time assistant (AKA: yard duty teacher) to a substitute teacher's aid. Spent over 3 months subbing long term at one school, working with Deaf and Hard of Hearing students. Successfully completed 33 college units. Spoke to several classrooms at a local elementary school, hopefully breaking stereotypes before they were built. Held a sensitivity training in a local hospital. Joined a hospital Patient Family Advisory Council, and was asked to join a second one that will start in 2015. Was turned into a super hero AND had a theme song written for/about me! Started writing a book...or two. Spent time with one of my Operation Mobilization London friends - in person - for the first time since 2012! Saw Wicked, the musical, for my fourth time. Had a murder mystery super hero birthday party! Celebrated the birth of my baby cousin, Erica! Made sugar cookies for the first time (ASL style). Bought more books than I have time to read. Was upgraded to first class and economy plus for free. Had my photo unintentionally go viral (to over 30 million strangers). Had my story written about in the local newspaper, The Fresno Bee. Enjoyed having sleepovers with my little sister, BreAnna! As well as tackling our summer bucket lists together. Received more encouragement from friends and strangers that I am SO thankful for. They'll never know how much their support and encouragement meant to me throughout the year. Did a lot of house sitting and babysitting. Went to Seattle and Portland. Spent time with my girls at Sugar Pine Christian Camp during the summer as a week-long counselor. Attended the Free Will Baptist National Convention. Spent time with dear friends. 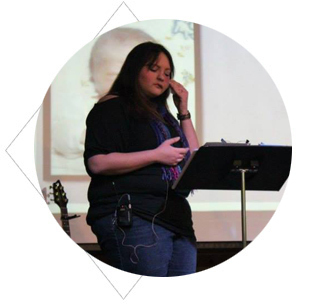 Spoke at a women's retreat (not as the main speaker, but for a 20 minute seminar/testimony time). Wrote articles for Randall House Publications (will be published in early 2015) and for the Treasure Magazine (published in the fall of 2014). Made a ton of new friends! Met Jack Canfield and was encouraged by him when I had the chance to talk with him about my life goals. Learned, matured, and grew a lot. Became stronger - and an overcomer. Made a gazillion God-sized dreams AND accomplished some of them too!! This year had a LOT of great moments. Many were planned for, dreamt of, and totally unexpected. (Many of which were really, really unexpected.) I am SO excited to see what 2015 has in store for me and my family. I don't know what's going to happen in the new year, but I do know that I am going to keep dreaming big - and I'm going to keep pursing my dreams. Who knows what doors God may open?? Happy New Year, my dear friends! Thanks for spending a part of it with me.